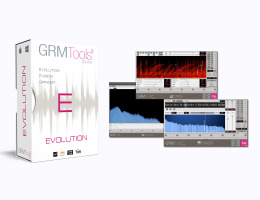 GRM Tools Evolution is perhaps the most original and unexpected piece of audio software we've encountered in the past decade ! Describing what Evolution really does is pretty difficult ! We therefore suggest you download the free demo version below (no iLok required) and experiment for yourself. We've opened a forum thread for users to bring their feedback and their experiences using these unconventional audio tools. As all new GRM Tools (third generation), Evolution is available in RTAS, VST and Audio Unit formats and can also be used in Stand-Alone mode. Conceived and crafted by the GRM Group (Groupe de Recherches Musicales) of the famous National Audiovisual Institute of Paris (France), GRM Tools is the result of numerous years of research and development by renowned composers and sound designers around the world involved in sound transformation technologies. Evolution allows powerful and unexpected spectral and harmonic audio transformations such as morphing, evolving textures, original VOCODER type effects, time shifted filters, sliding timbers, noising, etc. Evolution can also be used as very subtle audio treatment effects in delicate processing situations. The limits are only those of your imagination! Just experiment by yourself and send us your feedback ! Fusion modifies a sound by playing on delays, filters offset and frequential sliding. The input signal is represented by a sonogram which moves from right to left. 8 player heads of variable size and orientation can be placed on the sonogram. The players capture the signal running below them, like player heads placed along a magnetic tape or placed at different locations on a vinyl disc. They behave like band-pass filters and combine delay, filtering, reinjection and glissando effects. Grinder is used to degrade a sound by freezing its frequential or time changes, and by modifying its spectral resolution. It also enables incredible vocoder effects. The input signal is transformed into a sum of sine components whose quantity, and change in frequency and amplitude can be controlled. By adjusting the amplitudes, effects of signal distortion, saturation and degradation can be obtained, particularly for small numbers of components. By adjusting the changes of frequencies, it is possible to obtain impressing VOCODER effects. An integrated file player enables the use of another signal as a frequency or amplitude signal. Elastic String: allows you to achieve smooth movements of controlers. Starting with the 3.5 version an iLok is still required, but an iLok dongle is no required for authorization. With the iLok License Manager, you can deposit your license either on a 'computer' or on the 'iLok USB dongle', the choice is up to you. (iLok keys can be purchased from www.ilok.com or at your local dealer). Download and try the GRM Tools Evolution demo version without limitation of time. (No authorization required).